Most aircraft fly internationally and many non-EU operators use the Temporary Admission procedure when they fly within the EU. The basic simplified rule is that an aircraft owned, operated, registered or based outside the EU can use the Temporary Admission procedure. Unfortunately, certain grey zones often arise and one of them is; which entity is allowed to be the declarant? The declarant is the entity which name is mentioned on the customs form and the entity who takes responsibility for the customs process. The declarant is also, in the customs world, seen as the actual user of the aircraft. This role comes with both privileges and preconditions which must be met. It is for this reason that we want to establish another verification survey on how local customs authorities implement the rules for nominating a declarant with the use of the Temporary Admission procedure. We refer to Article 212(2) in Commission Delegated Regulation No 2015/2446 (“UCC DA“). Article 212(2) mentions: where means of transport are declared for temporary admission orally in accordance with Article 136 or by another act in accordance with Article 139, the authorization shall be granted to the person who has the physical control of the goods at the moment of the release of goods for the temporary admission procedure unless that person acts on behalf of another person. If so, the authorization shall be granted to the latter person. Article 212 should not leave any doubt that the entity responsible for the Temporary Admission entry, the declarant, must be the physical operator. This operator is, in general, the entity which employs the crew and provides the services and oversight to keep the aircraft flying. If the aircraft is managed by a third party, that management company should be the operator. This is often a situation with a lot of pitfalls as most aviation structures include many different entities such as user, owner, operator, lessee and lessor, etc. 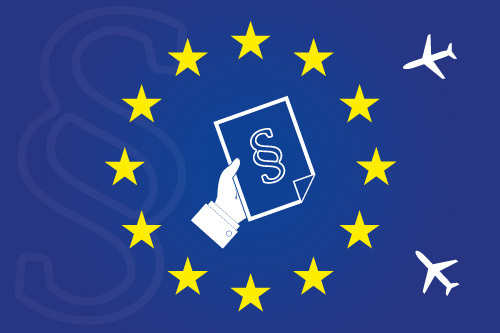 We regularly see a declarant nominated randomly and is therefore not a valid operator or sometimes a declarant is simply chosen because it is the only non-EU entity in the owner/operator/user structure. It is important that the declarant is acceptable as the real, physical operator and can prove this fact as well as claim responsibility as the operator. The declarant must, of course, be a non-EU resident. The feedback is unanimous; it is only the physical operator that can be the declarant. If this is done wrongly local customs might ask for a full importation to be completed with a full payment of the VAT and customs duty. The use of a wrong declarant means that the aircraft has been smuggled into the EU, so cherry-picking amongst available entities will not work and can result in the considerable, unforeseen cost. Which type of entity can be nominated as the declarant? 1) Local application of legislation and customs internal guidelines is unclear/unspecific. An owner (lessor) leases the aircraft to a corporation (lessee). The lessee does not have its own flight department to operate the aircraft and has, as a result, engaged a so-called management company (operator) to effectively operate the aircraft and provide all necessary services which includes the employment of pilots. The lessee does of course decide where to fly but the operator is the responsible part towards the aviation authorities and gives instructions to the pilots about aeronautical decisions. All entities are domiciled outside the EU and the aircraft registration is US (N). It is taken for granted that all preconditions for Temporary Admission are fulfilled.